Who doesn’t love a dragon? And a mystic one at that! In a time long since passed, with castles, fair maidens and knights in shining armour you will miss the fiery dragon’s breath, avoid the volcano and be rewarded with free spins and winning lines galore. A time of the dark ages, medieval times and dragons, with mystical keepers and even more mystical fire breathing while they flew over cities with walls built high. As the reels spin, it sounds like a dragon spluttering to cough, with a sore throat and hence no fire to breath. 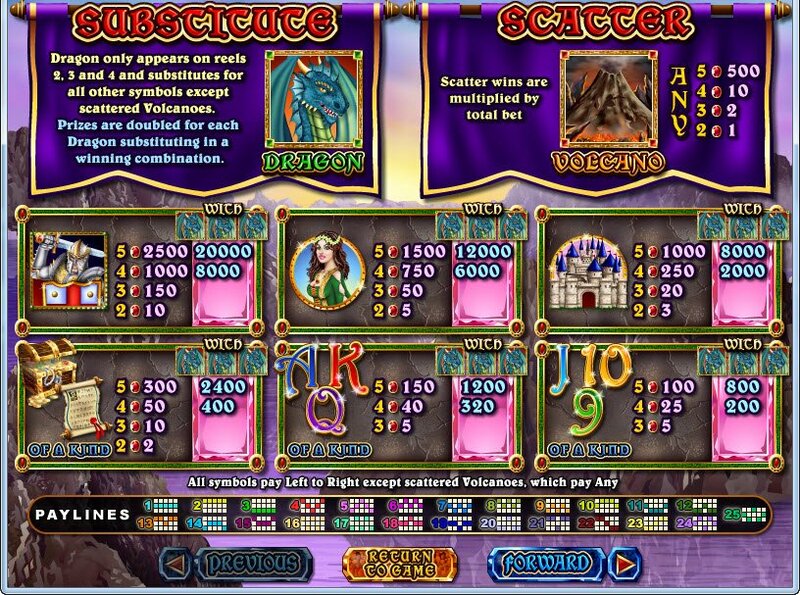 Once you spin symbols into winning lines, the Mystical Dragon slot will treat you to a spectacular fire breathing showdown, obviously the chicken soup the kindly mystics gave him helped. Or maybe the kind hearted princess in the tower gave him a silk scarf to wear around his draughty neck. We have the medieval arches of those high card numbers that make up our colourful low value graphics. 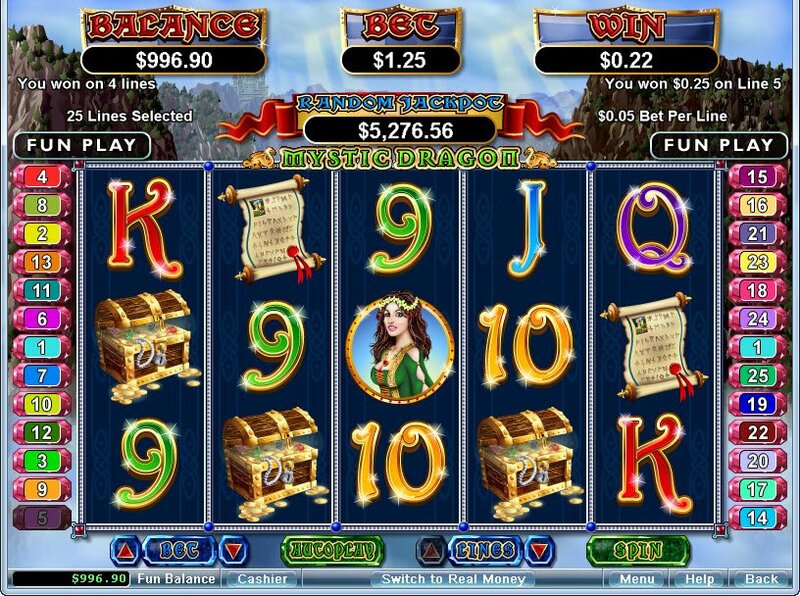 The fair maiden, the one with all those spare silk scarves, is a Mystic Dragon RTG slot game classic. With her glittering golden crown, and emerald coloured corset, I bet the dragon is not only interested in her luscious flowing locks. Then we have her purple tipped castle, each turret pointy and purple with a red door, not very good designers, the colour scheme is simply dreadful. Still, I'm betting the dragon doesn't mind. The dragon slayer, sword raised as he enters into battle has quite a nice armour, the colours are solid, and he could be part of King Arthurs round table itself, with his red edged emblem. The ultimate enjoyable feature is the Mystic Dragon slot random jackpot award. Not only do you need luck to avoid getting scorched, but the timing to receive this wondrous bonus feature. The blue, cute looking dragon is our substitute symbol and will selectively appear of reels 2, 3 and 4 and will double all your winning line prizes. 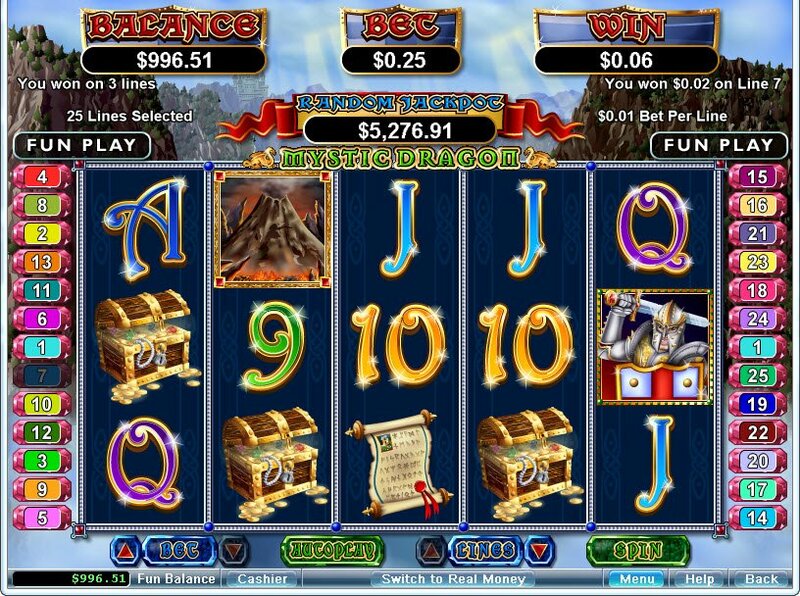 The volcano is the scatter symbol, and this fire producer will multiply your winnings by your total bet amount. Mystic Dragon slot bonus free spins will be your reward and will be triggered by all the fire!